I wanted an app to quickly transcode raw AAC to M4A, and this does it, no fuss, no muss. This is the fastest app ive used to convert my flac files to aac. I wasted $15 on another App that didnt even allow me to adjust the bit rate and the developer actually said for me to use handbrake. Well, i took a rish with this app and im very impressed. Im impressed with the encoder how detailed and high quality it is, and this thing is incredibly fast, highly recommend! ensure quality and quick conversion of audio and video files, such as music, songs, soundtracks and others, to MP4/M4A. 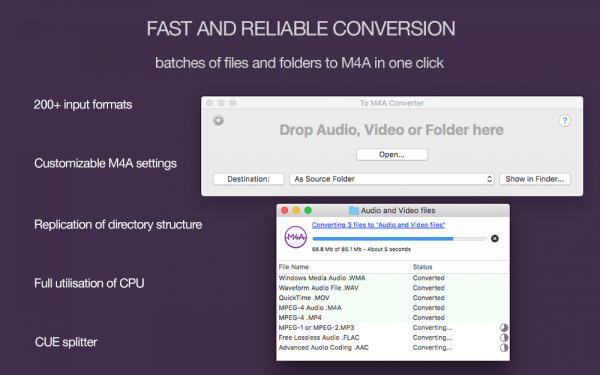 To M4A Converter converts most of video and audio input types of files, like: MP3, MP4, WMA, FLAC, AMR, CDA, OGG, AVI, WMV, AIFF, FLV, WAV, MPG, ASF, MPEG, MPE, MOV, 3GP, M4V, MKV, MOD, OGM, DV, VID and others. AAC-HE v1 (High-Efficiency AAC v1) - provides a medium-quality encoding at lower bitrates for mobile and broadcasting. AAC-HE v2 (High-Efficiency AAC v2) - provides medium-quality encoding for lower bitrates with the use of Parametric Stereo technology. Should be used for mobile, broadcasting and other domains where CD-quality is not essential. ALAC (Apple Lossless Audio Codec) - is the only lossless codec natively supported by iTunes and iOS devices. By default, automatic settings are selected, which ensure the best possible quality of audio by avoiding of useless resampling and remixing. Customized fixed settings for Sample Rate, Channels, Bit Rate, Bit Rate Mode, VBR Quality, Bit Depth, Compression Level and Codec also can be applied. You will find enjoyment in upper class of converted sound thanks to built-in volume adjuster and audio effects. 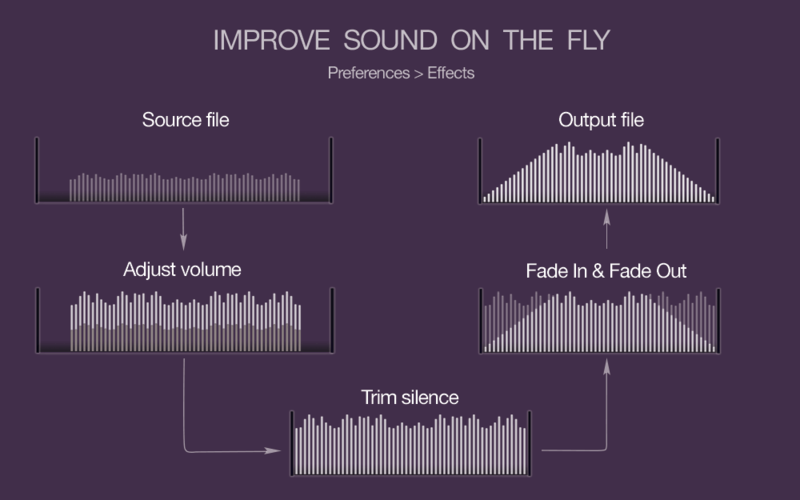 Volume adjuster amplifies the volume of too quiet sound or its parts like speech and voices. Audio effects include fade-in, fade-out, trimming of silence at the start and end of tracks. 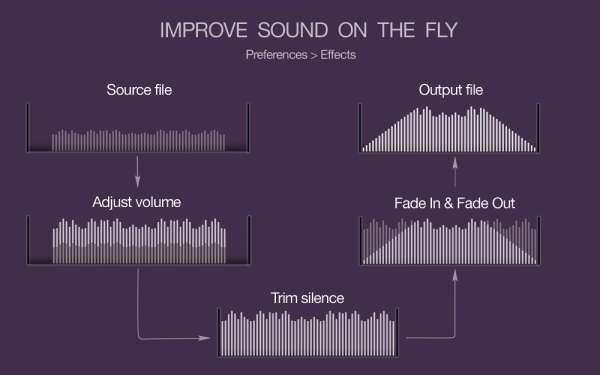 Enabling of audio effects like Fade-In and Fade-Out ensures the flawless transition between the songs. To M4A Converter can encode an unlimited number of media files and folders. Just drop your audio and video for conversion. 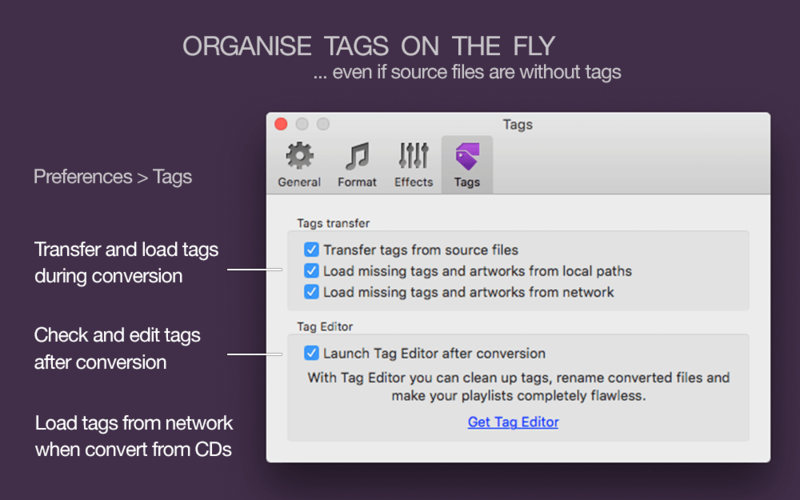 The application will keep folders' structure, original tags and file names for all output MP3s. You will be provided with detailed progress of every file's conversion and notified when encoding of all files is finished. To M4A Converter separates and transforms to M4A format ALL audio streams from a video. Some video files, such as MP4, WMV, AVI and MKV contain few audio tracks. It could be multiple languages tracks or audios for various types of hardware. The majority of MP4/M4A encoders capture only single audio track – that is defined as major by the movies’ creators. Even so, if you would like to extract all audio tracks from a video, you have to use a special application. 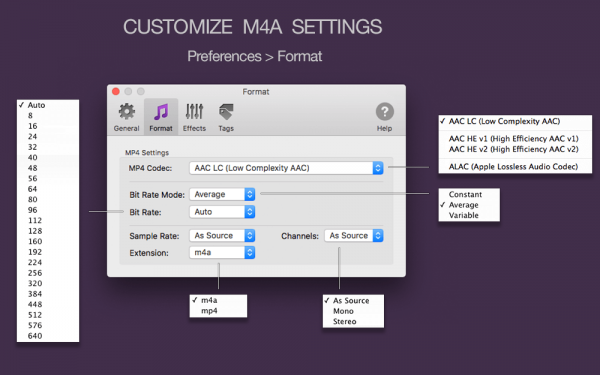 To M4A Converter is an ideal tool for such occasion – it rips every audio stream from a video. Thus, you only have to choose – which audio stream you prefer, since you will possess all of them. 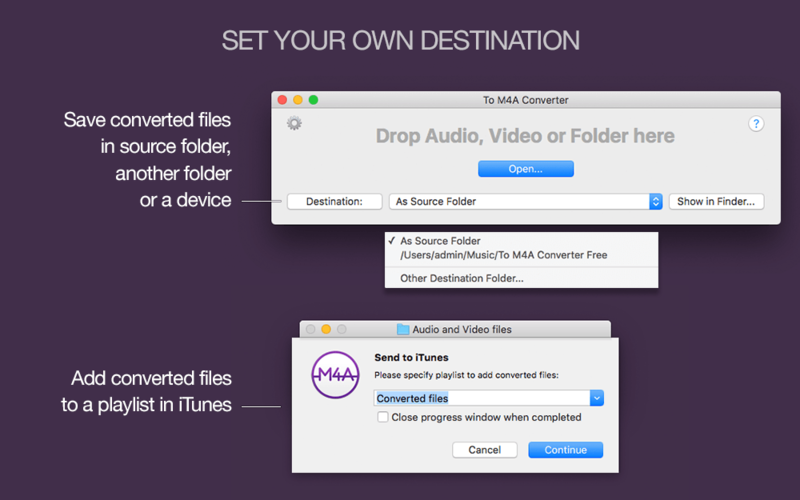 To convert media files to MP4/M4A format just select a destination folder and drop your files or folders to the app’s icon or interface. Converter advises when processing is made and if there are any failures. Convert utility is “crash free”. To M4A Converter supports the transfer of tags from source files to output M4A or MP4 files. You also can enjoy better-organised music thanks to loading missing MP4 tags from online databases or local folders and file names. **NOTE: DRM protected audio and VOB files cannot be converted because of the App Store policies.